The cover is a double sided wrap around poster. This catalog for Concordia University’s Faculty of Fine Arts (FOFA) Gallery annual undergraduate student exhibition was developed in collaboration with design students, artists, writers and dancers. Was printed and sold during the show. Design collaboration with Vincent Potvin, Madison Newey, and Shayna Dwor. This image shows the english text and the reverse side of the image that is folded and taped to the page. This image shows the double sided poster of another view of the artwork attached to the middle of the artist essay page. This image shows the french text and the reverse side of the image that is folded and taped to the page. This image shows the circular tape we used to attach the images to the essays on each artist. This non-permanent way of attaching the art allows people to remove them from the catalog and showcase in their homes. The poster removed from the catalog and ready to hang. The other side of the poster. Reverse image pf the catalog jacket wrap. This image was taken by projecting the title of the catalog and exhibition onto objects and photographing the scene. Alternate image. 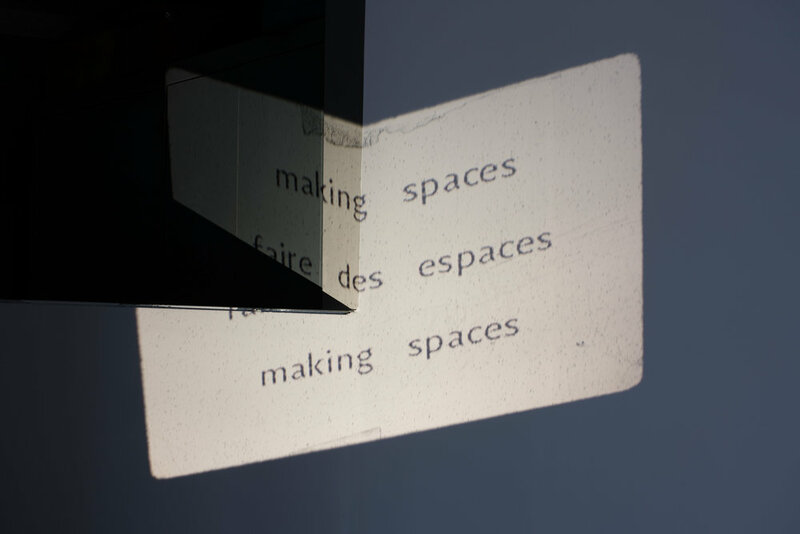 This image was taken by projecting the title of the catalog and exhibition onto spaces and photographing the scene.